Last Sunday, I had the opportunity to attend a financial literacy event in Ayala, Cebu – Let’s Have Some Funds. It was held by Sun Life. There were six speakers who gave insightful talks. Learned a lot, particularly 10 things that will definitely be useful not only for me but for all travelers out there. Let’s Have Some Funds! 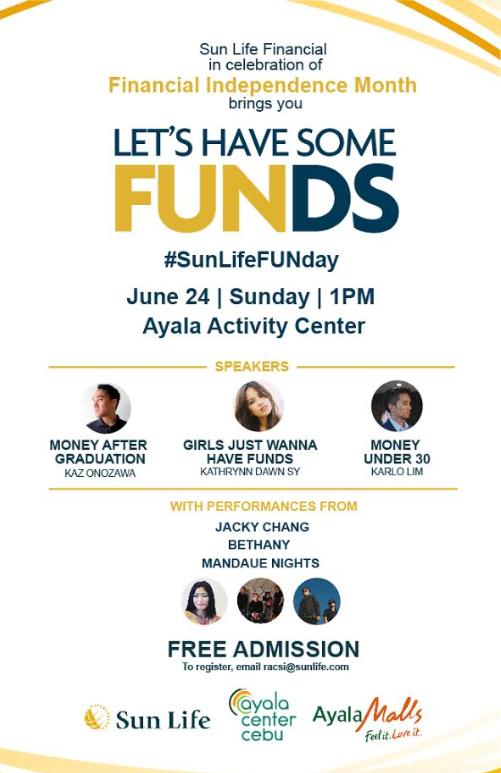 Financial Literacy Event by Sun Life. Traveling costs money. This is the truth, plain and simple. Yes, you can save money by taking advantage of free travel points from credit cards and airlines. You can also religiously stick to a budget. Still, there will be moments when you’ll have to open your wallet unexpectedly. you will come across some attractions or experiences that you just cannot miss. Or, it might be that there are souvenir items or delicious dishes that you’ll be hard-pressed to say no to. Perhaps there is a hotel or transportation emergency. Whatever the case, unexpected expenses are part of traveling. That is why I am also interested in finances so that I’ll be better equipped to manage my money while on the road. So, I make it a point to improve my financial literacy whenever possible. That is why I was so excited to attend the Sun Life event. It was titled “Let’s Have Funds”. And how exactly do we do that? Here are the main takeaways from that afternoon. One of the three main speakers was the entrepreneur, Kaz Onozawa. He had this great advice to impart. Instead of wasting time, use the breaks from your day job to work on your business and other passion projects. Basically, maximize time wisely to maximize your earnings. This will help us manage our money better. You can have one account for savings, another for the rainy days, and yet another for your business and other goals in life. As for myself, I have a travel savings account, which I make sure to deposit into as much as possible. This is yet another great advice from Kaz that resonated with me. You can jot things down or use a money management app. The important thing is to document your expenses so you’ll know exactly what you are spending on and if there is a need to cut back on some of those things. This is especially handy while traveling and making sure you stick to your travel budget. The second main speaker, Kathrynn Dawn Sy, had this to say. And she has a point. Kathrynn is a young entrepreneur and architecture and is an inspiration to all millennials. She advised that whatever talent you have, put it to good use. Of course, learn to reward yourself after working hard so that you don’t get tired of using your talents to their full potential. At the end of the day, this is what matters most. Listening to Kathrynn talk was really inspirational. Her main topic was Girls Just Want to Have Funds and it was an enjoyable talk. She believes that one must have confidence in oneself. Work hard to hone your skills and don’t be afraid to charge properly for those skills. In short, don’t underprice your services. The third main speaker of the event was Karlo Lim, a young influencer who is carving his own path in the food and fashion industry. One of his regrets was not managing his money well when he had his first job. So, he advised everyone to start investing and saving as early as possible to take advantage of the benefits of compound interest. Three of Sun Life’s financial advisors also gave talks during the event. They showed just how knowledgeable they are at their job. So, if you are starting out young and want to manage your money well, don’t hesitate to ask for help. Particularly that of a financial advisor’s. Their assistance will prove invaluable towards your search for financial literacy and freedom. Do not just wait for something good to happen to you because that is being passive. If you have a passion (whether for travel or something else) you wish to pursue, get off your behind and work hard for it. Most of all, learn to manage your finances better so you can allot money for pursuing what you love to do. This is especially important if you wish to grow your career or business. Network, network, and network some more. Even as an introvert, you can network and build strong professional relationships using tools such as the internet and social media. Although we must avoid debts as much as possible, we must know the difference between a good debt and bad debt. The latter is you taking out a loan for something that you cannot afford and is not really that necessary. Like that new LV bag or the latest phone. However, there are good debts such as a business loan, that can help you grow your business. Learn how to make the most of that. Aside from all of the financial lessons I got out of the event, I also enjoyed great music. This was because in between talks, Cebuano artists would entertain the audience. I was particularly excited for Mandaue Nights because I am a fan. Really love that synth pop! But the band, Bethany, and the amazing singer, Jacky Chang, also did great. Sending some love to Mandaue Nights! More great music from Cebuano artists. Overall, I am really happy to have attended Sun Life’s Let’s Have Funds event. Learned a lot and got inspired by the speakers. By acting upon all of these lessons, I really feel like I will be able to manage my money better and be able to pursue more travel opportunities. It was definitely an afternoon well spent! Previous articleKyoto Day 04: Made My Dream to Visit Daigoji Temple in Kyoto a Reality!